Bombay Sarvodaya Mandal volunteers protested against the nuclear tests carried out by Government of India at K. C. College Hall where defence minister George Fernandes was addressing a public meeting on May 18, 1998. The volunteers were arrested by police and were released after some time. 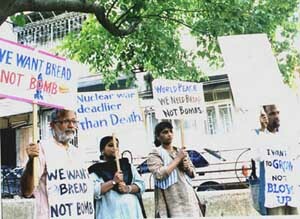 A day-long anti-nuclear bomb demonstration was held at Hutatma Chowk in Mumbai on Tuesday, May 26, 1998. Eminent writers, artistes, scientists, journalists, social activists and others taking an anti-nuclear stand participated in the Dharna. It was held under the banner of Movement Against Nuclear Bomb, which was formed at a meeting of citizens at the Bombay Sarvodaya Mandal. The initiative to form the group was taken by the Bombay Sarvodaya Mandal. The meeting was attended by film director and lyricist Sagar Sarhadi, filmmaker Anand Patwardhan, PUCL national vice-president Yogesh Kamdar, scientists Ashok Kumar and Prakash Burte, veteran journalist Dinoo Ranadive, former presidents of Bombay Union of Journalists Prakash Joshi and Jatin Desai, and veteran Gandhian T K Somaiya.